Why do flowers have different colors? While taking a saunter in a park or a garden, the one thing that never ceases to amaze us is the spectacular range of colorful flowers lined up in perfect rows, their gleaming colors mesmerizing us, as if they were celebrating in a state of jubilation. 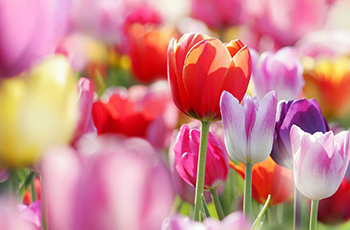 Have you ever wondered why flowers come in so many colors? How do flowers get their colors? Why are roses red and violets blue? Flowers amaze us with their resplendent colors. It is surprising that the science to explain for a flowers' color and that of a person's traits is the same.. Simply put, the reason a flower has red or yellow color is the same reason a person may be born with brown or black hair or possess blue or black flowers. Let us read on to unravel the mysteries behind the beautiful colors. Color in flowers!! 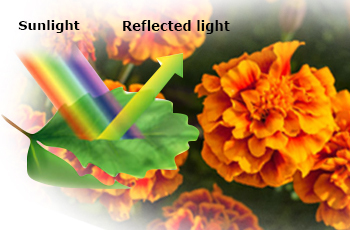 Color we see in flowers is actually the result of reflected light from various plant pigments. What gives color to the flowers? 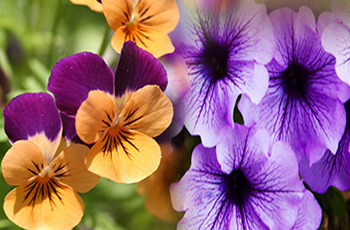 It is easy to spot flowers in a dazzling array of colors at flower gardens and in plant nurseries. And for any events and decorations, stunning flower bouquets seem to be everywhere. Have you ever wondered what makes a flower appear a certain color to us? For example, what substances make a rose be a deep, rich shade of red and what makes the daffodil shine with yellow hue? Pigments are responsible for many of the beautiful colors we see in the plant world. Yes! !, the multitude flower colors that are existing - red, pink, blue and purple come mainly from the pigments called chlorophylls, carotenoids, anthocyanins and betalins etc (pigments present in plants), which are in the class of chemicals called flavanoids (what gives plants their color). 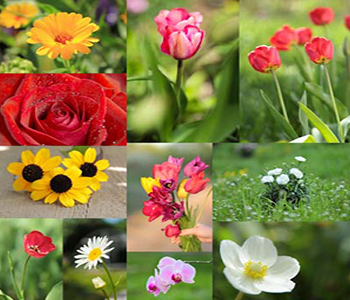 Color of the flowers merely exists to reproduce and multiply in plants. The incredible and fabulously beautiful color of flowers, such as the red in roses and yellow in daffodils and marigolds, are found in pigments that are decided upon in the genes (hereditary genome) of the plant. All these scientific terms really mean that, similar to people, plants carry certain pigments in their genes that decide before they are “born” what color they will be. 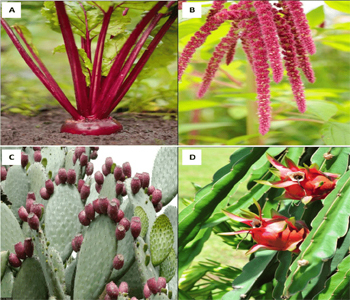 Floral pigments have a large role to play in pollination of flowers by animals. 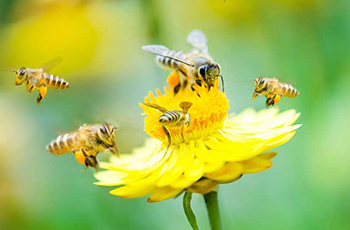 Flowering plants need to get pollen from one flower to another, either within a plant for self-pollination or between plants of the same species for cross-pollination to occur. Without pollinators, flowers couldn’t reproduce, and we wouldn’t have many of the flowers and fruits that we enjoy today. Pigments – The cause of color Pigments, like chlorophyll and carotenoids, absorb and reflect light at a certain region of the electromagnetic spectrum. Pigments are of different types. All the pigments present on earth (in plants and animals) collectively referred as biological pigments. Biological pigments (biochromes) are the substances produced by living organisms that have a color resulting from selective color absorption (light is absorbed and converted into energy. In the case of plants, this process is known as photosynthesis. When a light wave with a single frequency strikes an object, a number of things could happen. The light wave could be absorbed by the object, in which case its energy is converted to heat. The light wave could be reflected by the object). Multitude biological structures, such as skin, eyes, feathers, fur and hair contain pigments such as melanin in specialized cells called chromatophores. Pigment color differs from structural color in that it is the same for all viewing angles, whereas structural color is the result of selective reflection or iridescence (Iridescence is the phenomenon of certain surfaces that appear to change color as the angle of view or the angle of illumination changes. Examples of iridescence include soap bubbles, butterfly wings and sea shells, as well as certain minerals. ), usually because of multilayer structures. For example, butterfly wings typically contain structural color, although many butterflies have cells that contain pigment as well. The significant function of pigments in plants is photosynthesis, which uses the green pigment chlorophyll along with several yellow and red pigments that help to capture as much light energy as possible. Other vital functions of pigments in plants include attracting insects to flowers to encourage pollination. Plant pigments include a variety of different kinds of molecule, including porphyrins, carotenoids, anthocyanins and betalains. All biological pigments selectively absorb certain wavelengths of light while reflecting others. 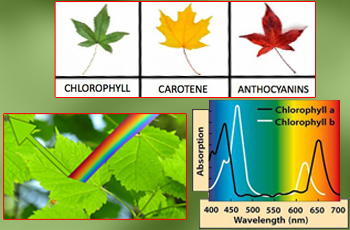 Chlorophyll: It is a pigment, and is responsible for the green color of foliage and leaves. It is a chlorin that absorbs yellow and blue wavelengths of light while reflecting green. More importantly, by enabling plants to produce oxygen during photosynthesis, it is critical to sustain our life on earth. Chlorophyll molecules are specifically arranged in and around pigment protein complexes called photosystems, which are embedded in the thylakoid membranes of chloroplasts for absorbing light and to continue the photosynthesis phenomenon. All land plants and green algae possess two forms of this pigment: chlorophyll a and chlorophyll b.
Carotenoids: These are plant pigments responsible for bright red, yellow and orange hues in many fruits and vegetables. They help plants absorb light energy to use in photosynthesis. They also have an important antioxidant function of deactivating free radicals — single oxygen atoms that can damage cells by reacting with other molecules. This pigment is also important to our diet, as the human body breaks down each carotene molecule to produce two vitamin A molecules which is essential to vision and normal growth and development. Two of the best known carotenoids are Beta-carotene and lycopene. Beta-carotene gives carrots, sweet potatoes, and other vegetables their orange color. Lycopene gives tomatoes their red color. When a person eats carrots or other foods containing carotenoids, the liver splits the carotenoid molecule in half to create two molecules of vitamin-A, an essential micro-nutrient. Anthocyanins are members of the flavonoid group Predominant in teas, honey, wines, fruits flowers, vegetables, nuts, olive oil, cocoa and cereals. Anthocyanins (literally “flower blue”) are water-soluble pigments that appear red to blue, according to the pH respectively. They occur in all tissues of higher plants, providing color in leaves, plant stem, roots, flowers, and fruits, though not always in sufficient quantities to be noticeable. Anthocyanins are most visible in the petals of flowers of many species. Blueberries, cranberries, and bilberries are rich in anthocyanins, as are the berries of the Rubus genus (including black raspberry, red raspberry and blackberry), blackcurrants, cherries, eggplant peel, black rice, grapes, red cabbage, and violet petals. Anthocyanins are partly responsible for the red and purple colors of some olives. Flavonoids (meaning yellow) are widely distributed in plants, fulfilling many functions. Flavonoids are the most important plant pigments for flower coloration, producing yellow or red/blue pigmentation in petals designed to attract pollinator animals. In higher plants, flavonoids are involved in UV filtration, symbiotic nitrogen fixation and floral pigmentation. They are seen most notably in lemons, oranges, and grapefruit. Flavonoids in flowers and fruit provide visual cues for animal pollinators and seed dispersers to locate their targets. Flavonoids are located in the cytoplasm and plastids. Many of the foods that we eat, including dark chocolate, strawberries, blueberries, cinnamon, pecans, walnuts, grapes, and cabbage, contain flavonoids. These chemicals lower cholesterol levels, and many have antioxidant properties. Betalains – Natural colorants The growing interest of consumers in the aesthetic, nutritional and safety aspects of food has increased the demand for natural pigments such as betalains to be used as alternative colorants in food products. yellow to orange (betaxanthin) pigments. Betacyanins are a type of food colorants. Betalains give rise to the unique deep red of beetroot. The composition of different betalain pigments can vary, giving rise to breeds of beetroot that are yellow or other colors, in addition to the familiar deep red. The betalains in beets include betanin, isobetanin, probetanin, and neobetanin (the red to violet ones are known collectively as betacyanin). Other pigments contained in beet are indicaxanthin and vulgaxanthins (yellow to orange pigments known as betaxanthins). Betalains cause the crimson of Amaranthus flowers. Betalains are close in structure and in their synthesis to the animal pigment group melanins, and to eulamelanins in particular. Hence multitude pigments are responsible for the beautiful colors that flowers exhibit.